My great-grandparents Marion and Nevella Lumpkins married on Valentine's Day in 1934 during the height of the Great Depression. Shortly after the wedding, they moved to a home in Codell, Kansas - a small rural community in Rooks County. Times were hard. While the country's economy was floundering, the farmlands that surrounded their home were parched. The Dust Bowl swept great swaths of prairie up into the air creating dark churning clouds of Kansas soil. Steady employment was scarce and made raising a family a constant struggle. Their daughter Marilyn recalled that, "it was all hardship, we just didn't know it. Times were rough, and it wasn't just us. It was everybody. 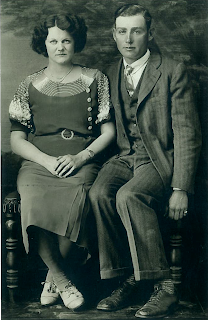 It was rough to skimp out a living..."
Marion managed to make ends meet by working odd jobs, including some that were bankrolled by the Works Progress Administration (WPA). Created as part of President Franklin Roosevelt's New Deal, the WPA employed 8.5 million people between 1935 and 1943. In the January-March 2016 issue of the NGS Magazine, Joseph F. Martin explained in an article on WPA records that, "As a government body, [the WPA] maintained files on those who were employed and the work they completed. Each worker's file could include valuable information for that person's biography as part of a family history." Curious about whether Marion had existing WPA employment records in the archives, I contacted the National Personnel Records Center at the National Archives in St. Louis, Missouri. A written response came from an archives technician who confirmed, "We have located a record related to the Works Progress Administration employment of your great grandfather." Beginning in August 1936, Marion was hired by the WPA for drought relief initiatives. According to his assignment slips, he helped construct ponds on family farms around Rooks County, presumably to provide water for irrigation that would prevent the parched earth that fed the Dust Bowl. Stamper Farm Pond in Stockton, Kansas. Marion earned 29 cents an hour for his WPA work. That was a good sum for the time. 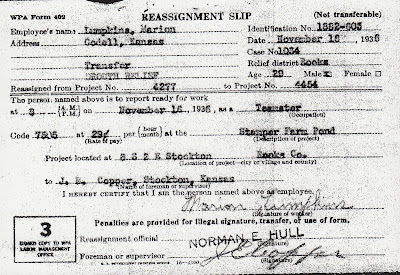 In his book, Kansas in the Great Depression: Work Relief, the Dole, and Rehabilitation, Peter Fearon wrote that, "The drought program was popular with participating farmers because WPA cash wages were considered much more generous than either RA [Resettlement Administration] grants or direct relief..."
Although his archived employment record with the WPA ended in December 1936, Marion said he worked on other New Deal development projects. During spring break of 1994, Marion loaded me and my cousins into his white Oldsmobile and drove us to an old country road northwest of Gorham, Kansas. After a long hour in the car, he pulled over onto the gravel shoulder. There was nothing to see but fields of farmland. No other cars were near and certainly no people. As I was beginning to wonder why this was our final destination, Marion pointed to the stone fence posts that wrapped the perimeter of the nearby field. "I quarried that stone," he said pointing to the long row of weathered limestone posts. He explained that he cut the stone from the earth, carved it into posts, and then set them along the perimeter of the property. Six decades later and his work still stood the test of time. Marion's pride in his job well done was a legacy he wanted his great-grandkids to see. I now recognize it was a mark of struggle and effort to provide for his family during our country's greatest hardship. That is a legacy in which I take great pride. Wow interesting! This is the first time I've been aware that these WPA information cards existed. They're an interesting record set. I paid for the National Archives to makes copies. It wasn't cheap. If you're able to obtain a copy of the microfilm and make your own copies, I recommend that. What a wonderful legacy! 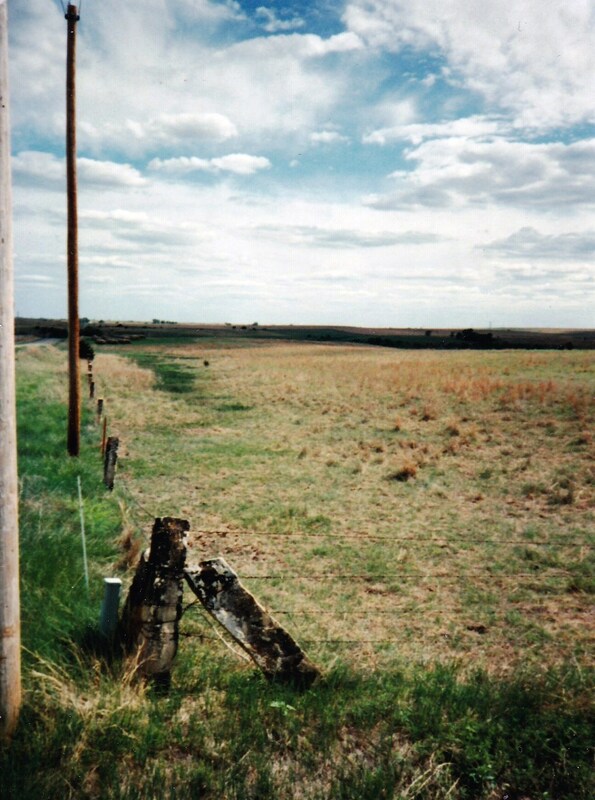 I bet you are glad your great-grandfather Marion took such pride in his work and showed you the stone fence posts. Once I put it into historical context I was very glad. It meant so much more, and clearly it meant a good deal to him. What a great story! Really brings to live what the WPA and FDR did to help people suffering because of the Depression. History feels so much more real when you're able to place your ancestors in it and see how they were impacted by the world around them. Lovely, evocative stuff, FS. Great tip on the WPA records, too! Thank you, Derek. Hope you're able to use the tip and find your ancestors in the WPA records, too. That's great. So happy for you that he took you to show you his work instead of just telling you about it. Me too! I wish I would have had a greater interest in family history at the time, but it's a great memory.